Brooklyn can’t sleep. Her boyfriend, Lucca died a year ago, and now their friend Gabe has died of an overdose. Every time she closes her eyes, Gabe’s ghost is there, waiting for her. She has no idea what he wants or why it isn’t Lucca chasing her through her dreams. Lisa Schroeder is an amazing and inspiring author that I discovered in January when I picked up “Far From You” off of our local library shelves. It was one of my very favorites so far and I was thrilled she had more books out there. 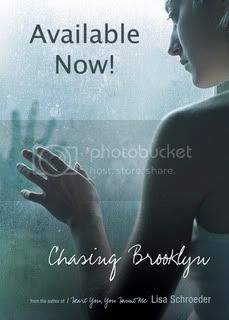 Chasing Brooklyn is written in her signature style of poetic verse which makes for a short and emotional read. I am amazed at how deeply one can connect to the story in so few words. Truly each of Lisa’s books are a masterpiece. This one was a bit more creepy and eery with a paranormal element. Brooklyn and Nico’s alternate writing journal entries about their joint loss of Lucca. Both are haunted by their dead friends and each has a journey of healing from the loss. You will sympathize with their grief and deep longing to resolve nightmares and the sense of being haunted. Schroder writes in a way that teens will understand. The voice is resoundingly one of healing and endurance. She teaches that thick in the midst of loss there is hope through love, through learning to trust again. the picnic scene and description of how Nicco and Brooklyn feel towards each other as feelings start to develop. The kiss! That the two main characters are training for a triathlon together. They have something they are working toward and they are strong, each in their own way. Nicco is an incredible person. He does his best to pull Brooklyn out of her depression while holding onto himself. It’s admirable that neither one of the main characters jumps into love quickly. It is a slow going process of getting to know each other and supporting one another. an ending. I was so disappointed when I turned to the last page. I wanted to know more about Brooklyn, Nico and Lucca and less about Gabe. He was just a little too creepy for me. In short, once you’ve started this story, you can’t get enough! Truly hoping Lisa writes another companion novel to complete what was started with “I Love you. You Haunt Me.” If you haven’t picked up any of Lisa Schroeder’s books, you must! They are a guaranteed good read. Courtesy of Simon & Schuster, we have 5 copies of this book to give away to US & Canadian Residents. (We have read it and it’s really GOOD!) Here’s how to enter…. Place it on your Blog, Facebook, MySpace, or anywhere else you can think of 🙂 Post a link to each place you have posted it, in the contest thread in our forum. You will receive one entry for each place you post it. Contest runs through Sunday, January 10!